NASA's next-generation, five-segment solid rocket development motor - or DM-2 - is fully assembled in its test stand at ATK in Promontory, Utah. Engineers plan to conduct a static-fire test - firing the rocket horizontally while it's bolted to the ground - in September 2010. NASA is pushing ahead with work on its new Orion space capsuleand Ares rockets despite their ambiguous status as lawmakers discuss theagency's 2011 budget request. Orion and Ares are part of Constellation,a NASA program designed to take astronauts back to the moon. Under his 2011budget proposal, President Barack Obama called for canceling Constellation and urgedNASA to work toward sending humans to an asteroid and then on to Mars. The outlook for Constellation's fledgling rocket and capsulespacecraft is not clear. Obama did recommend continuing development of Orion ? butto be used only as anescape ship that could carry astronauts home from the International SpaceStation in an emergency. A NASAauthorization bill recently passed by the Senate would direct the spaceagency to continue developing Orion and to fast-track plans for heavy-liftrockets and vehicles required for space exploration beyond low-Earth orbit. Adifferent bill under consideration in the House also seeks to revive some Constellationplans, including Orion and the Ares rockets. Since 2006, the National Aeronautics and Space Administrationhas contracted with Lockheed Martin to build the Orion spacecraft ? a21,000-pound (9,500-kg) capsule that would ride atop a rocket to carry a crewof four to six into space. Regardless of Orion's future, Lockheed is contracted tocontinue working on it throughout this year. "We have been on contract to execute the 2010 plan, andthere are a lot of accomplishments and milestones in that plan," said LarryPrice, Lockheed's Orion deputy program manager. He acknowledged that the political uncertainty isdistracting. "It is a disturbance, people wonder what'shappening," Price told SPACE.com. "But people are doing this becausethey are passionate about it. It is exciting, inspiring work to be building ahuman spacecraft to go beyond low Earth orbit." Among recent milestones was a test in May that demonstratedthe spacecraft'sabort system, a set of solid rocket motors that could eject the capsulefrom a malfunctioning rocket and land it safely on the ground. In terms of safety,that system could give the vehicle a leg up on the space shuttle, since theshuttle system was deemed too complicated to incorporate such an escape method. Lockheed, with subcontractor Ball Aerospace, also recentlytested a new docking navigation system for Orion. That system is due to betested in space by astronauts aboard the STS-134 space shuttle when it flies tothe space station in February. It will be part of a test being called STORRM,for "Sensor Test for Orion Relative Navigation Risk Mitigation." "STORRM continues unaffected by current events,"Ball Aerospace spokeswoman Roz Brown wrote in an e-mail. She said the STORRMunit was integrated into the shuttle Endeavor earlier this month. The Orion spacecraft reached another milestone when itsdesign passed the Phase 1 safety review of NASA's Human Rating Requirements, arigorous examination to make sure the capsule's design is sound for carrying people. "It says the design is in synch with the humanrequirements, not only the functional requirements" of traveling to space,Price said. Orion was originally intended to fly atop an Ares I rocket,a next-generation booster planned under Constellation. The Obama administration's proposal scrapped plans for AresI and its big sibling, the Ares V heavy-lift rocket. Yet some lawmakers arelobbying to revive plans for the vehicles. 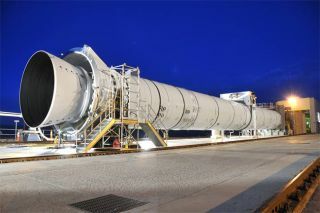 NASA has contracted with Alliant Techsystems to build thebooster's solid-rocket first stage, and with Boeing to build the vehicle'sliquid-fueled second stage. Last October NASA conducted a test launch of its Ares I-X vehicle, aprototype for Ares I. This test version, which included a real first stage anda dummy second stage and capsule, lifted off to about 28 miles (45 km) altitudefrom Kennedy Space Center in Florida. Alliant Techsystems (ATK) is planning another major test forAug. 31. Engineers will conduct a static-fire test of the Ares I's first-stagesolid rocket Development Motor at the company's facility in Promontory, Utah.For a static-fire test, the five-segment, 154-foot-long ? (47-meter-long) motorwill be held on the ground horizontally while the engine fires sideways. "A robust ground and flight test program is a criticalpart of human-rating to ensure reliability and safety when launching crew intoany orbit," Charlie Precourt, vice president and general manager of ATKSpace Launch Systems, said in a statement. "This test is a vital milestonein further growing the performance database for this new five-segment solidrocket motor."